Save AED 88 (70.40%) – Earn 4 Shukrans What is Shukran? Shukran is the Landmark Group’s award-winning loyalty programme in the Middle East, which allows you to earn Shukrans when you shop any of our brands. 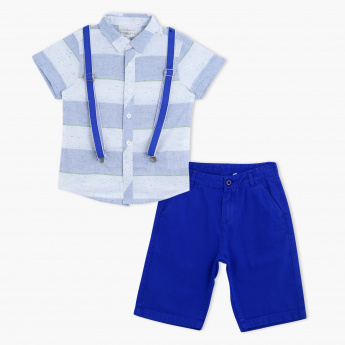 Dress your little champ in this set and be sure to fetch attention of the crowd. The shirt sports horizontal stripes for classy looks and is clubbed with shorts that complement the shirt giving your kid a modish look. This set also includes a suspender to offer a great fit.